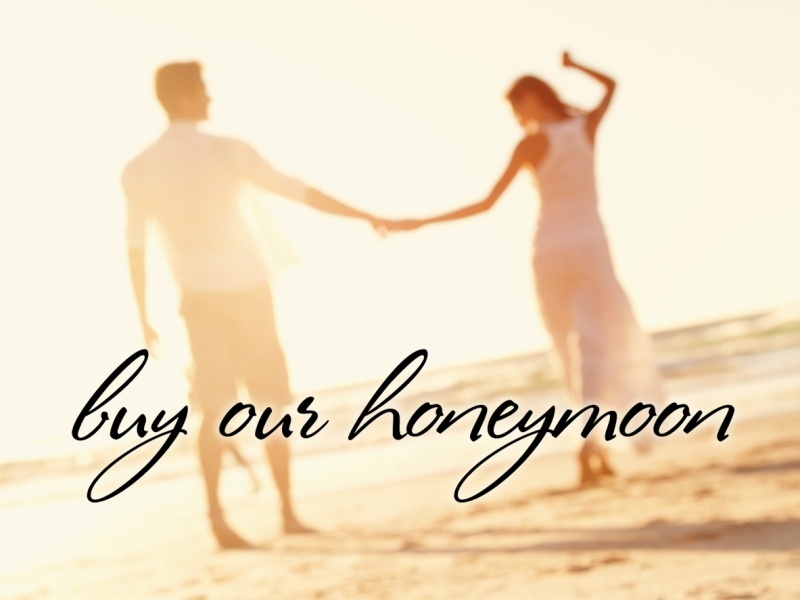 Buy Our Honeymoon is the UK’s top wedding gift list service to begin your married life with the trip of a lifetime. Our service helps you create and manage a unique wishlist of gifts for your dream honeymoon. If you don't need the traditional gifts for starting a new home, but feel that just asking for cold, hard cash takes all the fun and romance away, you’ve found the perfect wedding list. 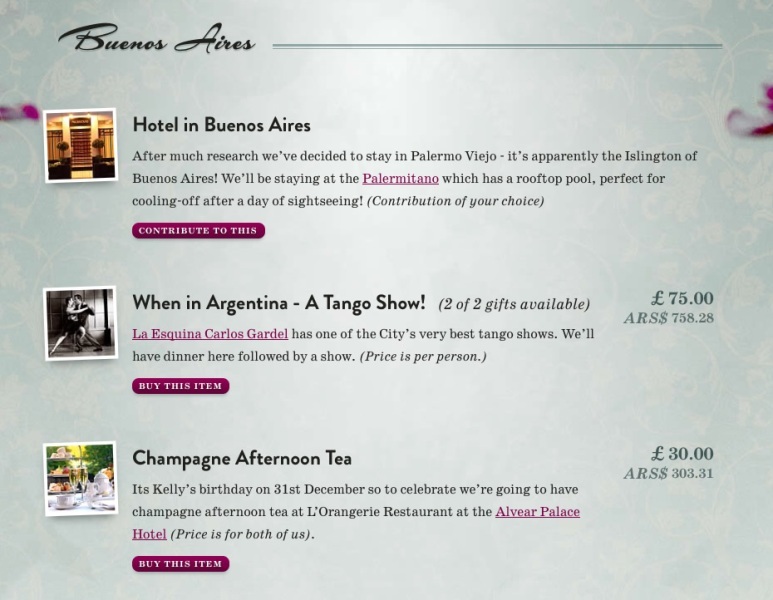 It works in a very similar way to a traditional department store gift registry, but instead of kitchen implements or fresh towels, you put together a list of experiences and activities for your honeymoon — from activities, meals and shows, to contributions towards your first night's accommodation, or a taxi ride from the airport. You're limited only by your imagination in what to include, from tiny, meaningful treats all the way to once-in-a-lifetime luxuries. And your friends and family will feel that they're giving a real present that you'll value, and which isn't simply measured by how much they've spent. How long have you been doing what you do? How did you get into it, how did you start your business? 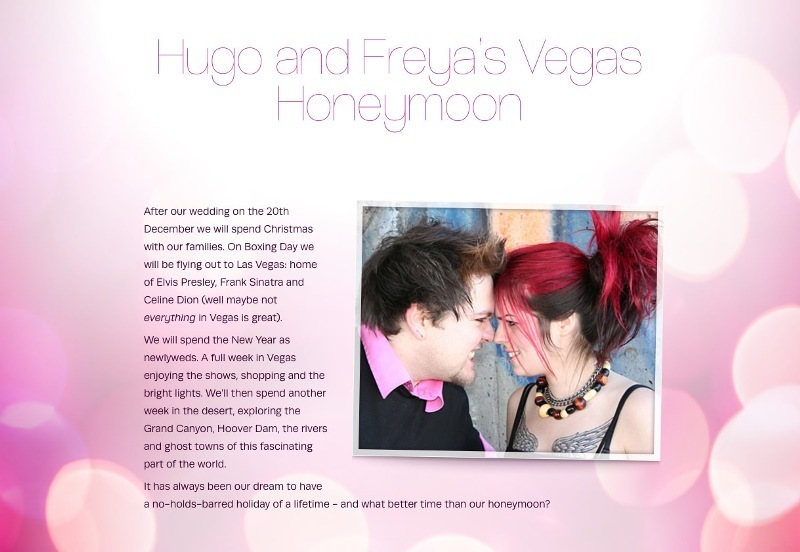 We initially created Buy Our Honeymoon for our own wedding nearly ten years ago. We’d been living together for quite a while, and we simply didn’t need the traditional gifts for staring a home together. Our little flat just didn’t have room for more stuff! We realised that the thing that would mean the most to us was making our honeymoon as special as possible. The idea went down so well with our guests that we were persuaded to develop the site for other people to use. It’s now been seven years since we launched, and we’ve become the UK’s top gift list for your dream honeymoon. Our service is for couples who are actively seeking an alternative to a traditional department store registry. Couples whose biggest wish is instead to achieve the honeymoon of their dreams — whatever that may be — with the love and support of their friends and family. 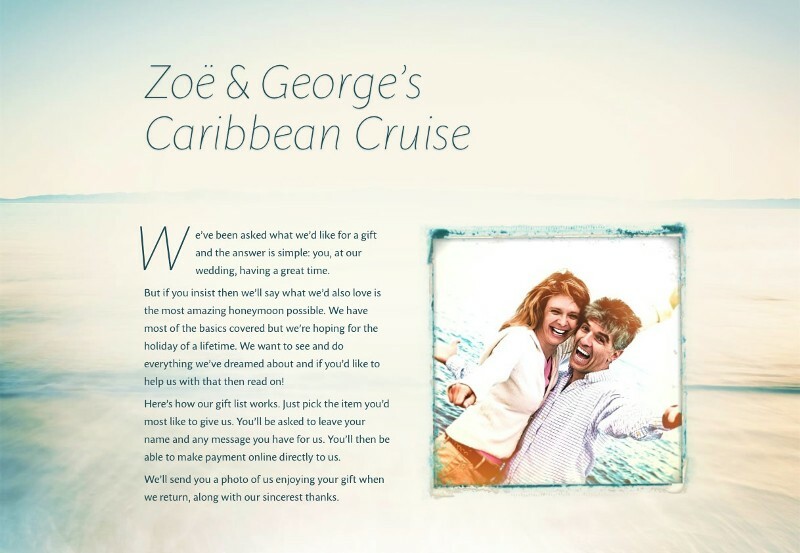 As a business, we pioneered the zero-commission model for honeymoon gift lists in the UK, allowing our couples to be completely independent of us in terms of the financial transactions for their gifts. We provide complete support for both couples and their guests, helping to coordinate and manage payments — and we’re the only service that facilitates gift payments by Direct Debit. Our service is about making honeymoon contributions as real, as polite, and as memorable as physical gifts. We were the first company to introduce the concept of detailed, customisable design themes for wedding gift lists, allowing our couples to truly reflect themselves and their hopes for their big day and beyond. Many of our couples really get creative with their list — to tell the story of their honeymoon: where they’re headed, why it’s important to them, what they most hope to remember from the experience. There are no limits to what you can include! 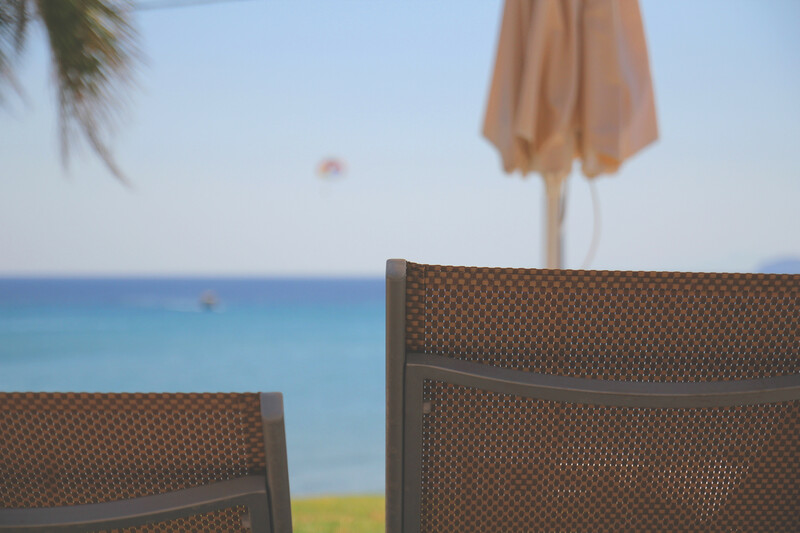 We’re not a travel agent — and although there are agents who’ll pay for our service as an extra part of theirs, we’re completely independent. You can book whenever you want, with whomever you want: get the best deal possible for you, and help finance it through our service. Some couples leave a gap between their wedding and honeymoon, and give themselves the opportunity to see how they’re set for funds before making a booking. On their list, they can be quite open about this — we don’t yet know whether we’ll be in Butlins or Bermuda! But whether you’re staying in a beach hut or a boutique B&B, there’ll be a first night of your honeymoon, and a last night too. Those can make wonderful, romantic gifts! Our simple one-off fee means that you’re not funding the site out of your gifts. Charges for online payment processing can’t be avoided, but we aim to minimise these as much as possible, and for both you and your guests to have the option to make alternative arrangements. Couples using our system for gift payments by Direct Debit only pay processing fees of 1% (none of which goes to us). It’s super-easy for you to set up, convenient for your guests to use, and totally secure for everyone. 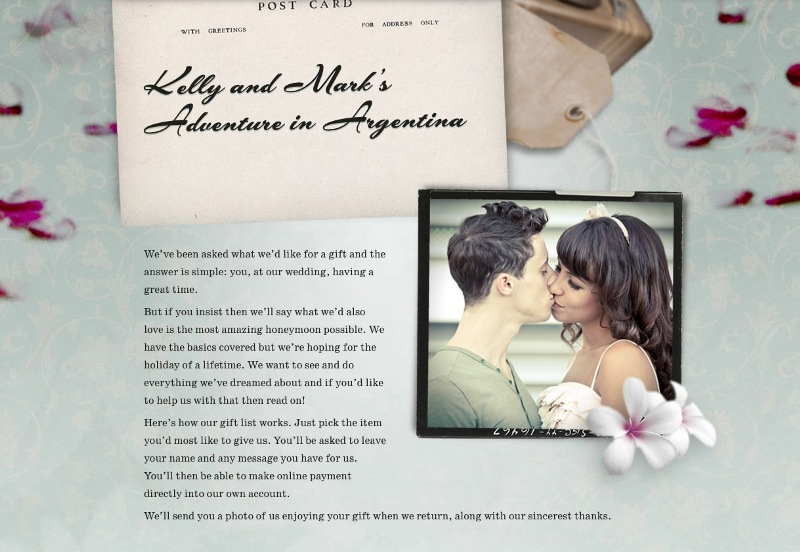 Readers of Pretty Thrifty can get 20% off the cost of their honeymoon gift list! Just enter the promotional code PRETTYTHRIFTY when you start your free trial. We have lovely feedback from couples, and incredible word-of-mouth support, for which we're so grateful. Our job is great because we run the company. If someone suggests an option they would like, or we see an area for development, we are able to make the necessary changes right away. We never keep still! 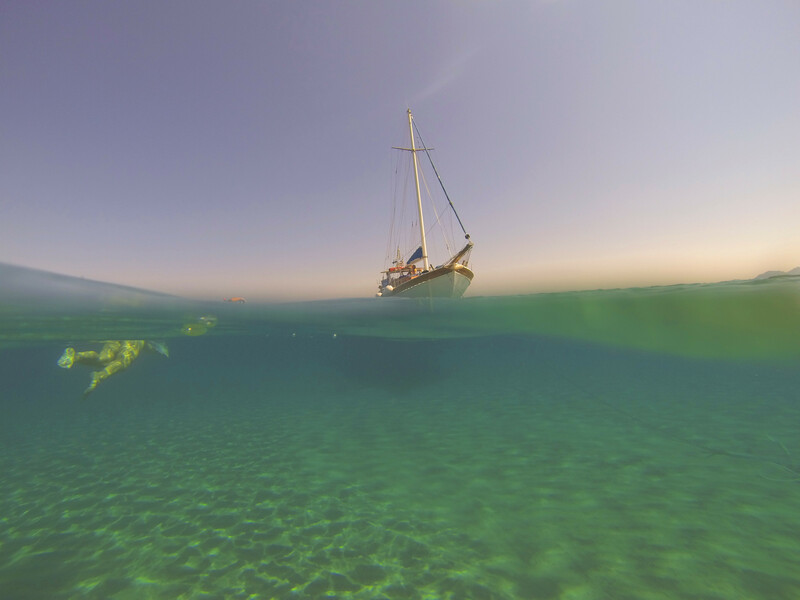 The best time to go for the honeymoon for the couples is basically in the month of winter. This may sometimes even decided based upon the couples wish and their will. The winter season helps in making the atmosphere good for the honeymooners to spend out their days and night in most romantic way. Honeymoon tours are the dreams of some couples. Thus, they should carefully opt for the best services to enjoy the tour without worrying about the budget and other problems. It is important to seek the right travel agent/company that provides you with the best tour packages. It becomes much more necessary when it comes to honeymoon, so couples should choose carefully.